It feels like many moons ago that I first stumbled upon the hitherto unknown BASTILLE on Soundcloud. Back then, the guise was solely occupied by Dan Smith but soon after, BASTILLE had become a quartet - an outfit to match Smith's grandiose pop vision. His vision has been realised with the triumphant debut album 'Bad Blood'. 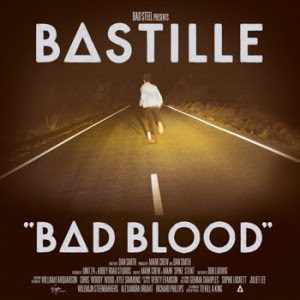 'Bad Blood' opens with the singalong single 'Pompeii', showcasing Smith's emotive vocals amid the anthemic synth-based pop that the band are already becoming famous for - the single incredibly debuting at #2 in the UK singles chart recently. Other bands might have subsequently faltered had they led with such a strong opening track but not BASTILLE. Throwing themselves into the darkly cinematic world they've consumed on their Other People's Heartache mixtapes, the album takes a decidedly melodramatic turn. The grandiose production quickly takes the centre stage - empowering the demos and turning live favourites into glorious studio songs. Sweeping strings, choral vocals, and pounding percussion echo the incredible production seen on the likes of Arcade Fire's 'Neon Bible' and Jonsi's 'Go'. The unexpected sounds shown on the likes of the reggae-infused 'Bad Blood' and the calypso-inspired 'These Streets' demonstrate the band's ambition and ability to not only traverse but meld a series of genres. This is arguably exhibited best on the confusingly brilliant 'Weight Of Living Pt.II', which amazingly seems to mix Kraftwerk, Genesis and Wham. Admittedly, the band's ambition doesn't always find itself well executed - the slow paced 'Oblivion' feels misplaced on the album, perhaps better suited to a b-side. BASTILLE are at their best when they aim for rousing stadium-pop - 'Icarus', the track that first wowed me back in 2010, soars more successfully than the mythical Icarus himself, while another hit single 'Flaws' sparkles magnificently. This is a band that know their way around melodies and know how to put a chorus together - more than that, BASTILLE know how to put together a stunning album. 'Bad Blood' is a terrific blueprint of 21st century pop, emboldened by BASTILLE's soaring ambition. Lesser bands would have been crippled by their range of ideas but the production skill of Mark Crew and the ability of BASTILLE has resulted in a majestic debut album - brilliantly bringing an array of influences to the fore, transforming these excellent pop songs into bewitching behemoths. Perhaps best demonstrated on the other-worldly closing track, 'Weight Of Living Pt.I'. Sleep easy, pop is in good hands. 'Bad Blood' is available to purchase from amazon.co.uk. Find more info at bastillebastille.com.